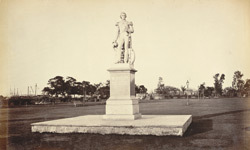 Photograph of Sir William Peel's statue in Eden Gardens from 'Views of Calcutta and Barrakpore was taken by Samuel Bourne in the 1860s. Sir William Peel (1824-1858) was a son of Sir Robert Peel, Prime Minister of Britain. During the Uprising of 1857-1858, he was the commander of the Shannon and lead a naval brigade. He died in Kanpur of smallpox in 1858. Eden Gardens, located in the north corner of the Maidan in Calcutta along the banks of the Hoogly river, was named after Emily and Fanny Eden, the sisters of Lord Auckland, the Governor-General of India (1836-1842).